So you've read Lesson Zero, which taught you some basic principles using pseudosteno, and now you're ready to start learning real steno. In order to keep it at a manageable level, I'm going to focus this lesson on two main groups of letters: The vowels, including chorded vowel combinations, and the consonants which appear as single letters on both sides of the steno keyboard. Let's look at the single vowels first: A, O, E, and U. They're all single-key vowels. (EU, even though it's a chord and not a letter, should also be grouped with them rather than with the vowel chords below, because it corresponds to the letter "I" and works like a single-key vowel). You'll see from the examples that a single vowel can stand for a few different vowel sounds. That's because, even though English has a fairly large number of actual vowel sounds, English spelling breaks vowels up into two rough categories: "short", which consists of a single vowel on its own, and "long", which consists of a doubled vowel, a diphthong (two different vowels together), or a vowel whose sound is modified by another vowel elsewhere in the word. The steno theory I learned, while mostly phonetic, sometimes uses spelling to inform how to write a word. So if a word is written with a single "short" vowel, it will usually be written with the same vowel on the steno machine, regardless of what it actually sounds like. "Pert" and "Purr" have the same sound, but "pert" is written with the E key, and "purr" with the U key. The theory also uses spelling cues to differentiate between long-vowel soundalike words. I spoke a little about this in Lesson Zero, but now that you see the whole vowel chart, it should make more sense. You can see that words containing "ea" together are written with "AE", while the words with the same long A sound that don't contain "ea" together are written phonetically, with "AEU". (Or, in the case of a word pair like "breech" and "breach", with the long E sound, "AOE", for breech, while breach would be written "BRAECH" in pseudosteno.) This is the main use for the "AE" key combination, so you can see that it's really a conflict differentiator, rather than a vowel sound per se. That covers the second group of steno vowels. The last group covers so-called "long" vowel sounds and diphthongs, and it's going to involve the most straight-up memorization. The good news is that these operate almost entirely phonetically, so you don't have to concern yourself with spelling. Eventually I'm going to make a steno tutorial video game that will teach you these sounds and drill you on them, but for now you're going to have to memorize them on your own, with whatever method that works. Let's ditch the pseudosteno and move into some actual steno. 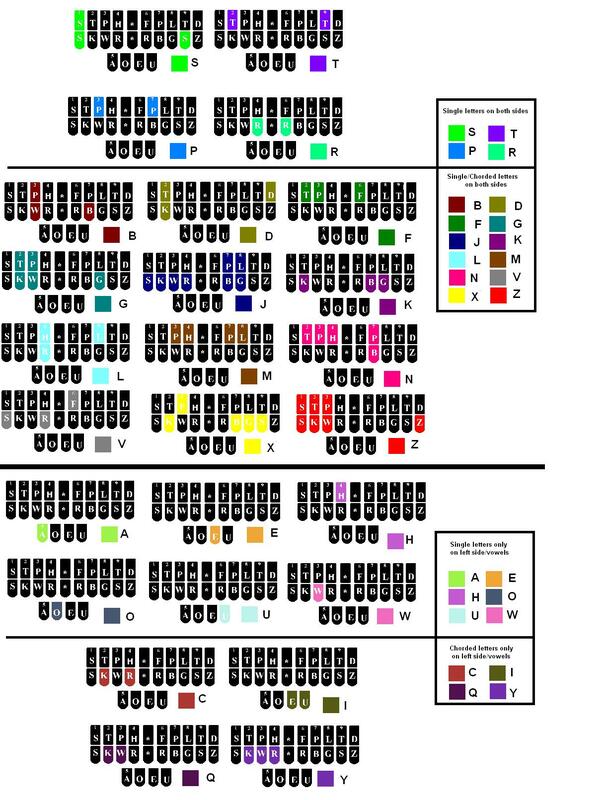 In this lesson we're only going to deal with the top section of the complete steno layout chart that I posted several weeks ago. Now try making some more chords, using different vowel sounds and different combinations of letters. Let me know what you come up with in the comments. Feedback is always welcome. In the next lesson, we'll start learning chorded consonants. Stay tuned! I don't understand how this works. I tried chording SAS but it output "asker"; when I tried chording SAE it output "Sr.", not "sass" or "sea". I tried TAO and got a comma. Am I misunderstanding what http://stenoknight.com/STPRRPTS.jpg is saying? Two things to check out: Is your keyboard layout set to Dvorak? If so, set it to qwerty and then try again. If it's already set to qwerty, are you sure your keyboard has true n-key rollover? What comes out when you just press the "a" key in qwerty layout, which corresponds to the "S-" key in steno? It should translate as "is". It's usually on Dvorak, but I switched to QWERTY and verified before turning on Plover. "a" with Plover on does translate to "is". I'm using Happy Hacking Keyboard Professional 2 which has 6-key rollover. I'm unsure if this should make a difference. Will test with Das Keyboard later. 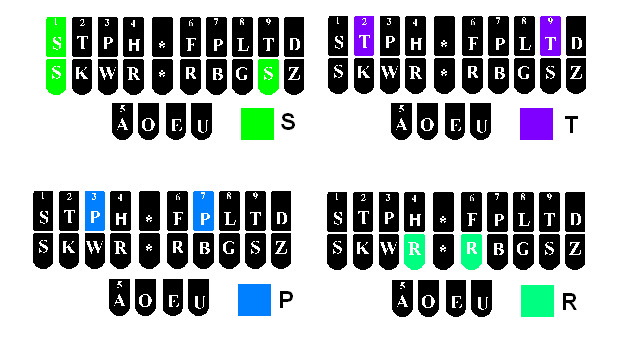 I just realized that the qwerty-to-steno key map was posted way back in March without any recent links pointing it out, and it's not exactly intuitive. Sorry about that! Kind of a huge detail to overlook. Do you mind checking out the blog post I just made (http://plover.stenoknight.com/2010/10/qwerty-to-steno-key-map.html) and seeing if maybe the issue was a matter of finger placement? If you're still unable to make it work, I'd be very interested to see your output if, for instance, you write the "so is this working?" sentence and get something other than that out of Plover. Thanks for getting back to me! I verify before testing that I am in QWERTY by typing asdf which comes out as asdf instead of aoeu. I think I've just discovered the problem, though. The default layout in the OS is Programmer Dvorak, but even if I switch to QWERTY (in Gnome) Plover sees the Dvorak layout. I tried switching to QWERTY before running Plover, but got the same issue. When the Gnome key layout is set to QWERTY, if I chord as if I am in Dvorak, it comes out correctly. If I do `setxkbmap -layout us` it seems to work after that. Bit inconvenient though. Know of a better fix? Hey, Jack. I've sent a description of this bug to the programmer and he's going to put it in the bug queue. Thanks for reporting it! I hope it's not too horribly inconvenient for now. How does one write "wrought" if not as "raut"? Well, you could write it WRAUT or WROT or even WRAUGT, if you wanted to. A "tor" is a kind of rocky hill formation. A "po" is a chamberpot. Neither of these are words I type very much, it's true. Good thinking, Marnanel. I knew about "tor", but not "po". Hm. When I get around to making a new version of the chart, I'll definitely fix those. It might give you a better idea of how it all works. Just give me a hint, please. I just got the Prowriter Plus working with Plover on Windows. But I'm not getting those words. I get "so are" for SAOR, and "so." for SOP, for example. I've got Plover and Prowriter set to Baron TX. Great to hear you got it working! I think your problem might be with the default dictionary and not with the translation engine. What do you get for the other S- words in the chart? Do any of them translate properly? Sorry for the trouble. These are the words I got. Some of them may be user error. But "the" for T and "." for P seem to be consistent. I don't know anything about the Prowriter Plus. It came with this very old machine I bought on ebay. For what it's worth, the little display on the Prowriter is showing the correct letters pushed. I'm not sure the device even has a dictionary. It looks like it just sends letters to the computer. I'm surprised I got it working. I'd be ecstatic if I could use plover with it! Okay. 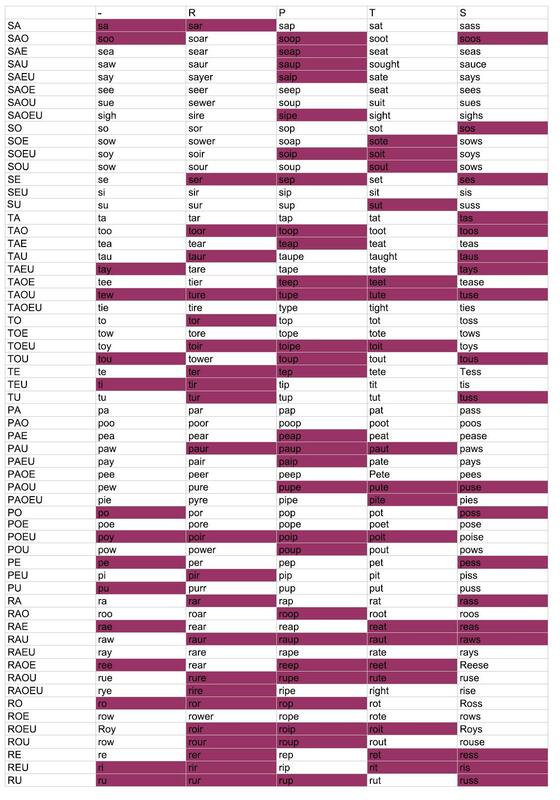 Here are the single key words. These are the single-key words. * is delete. Hm. Yeah, that's not a dictionary issue. Fooey. Looks like Plover is improperly splitting your strokes apart. Sorry about that. Can you lodge a bug at the Github? Unfortunately it might not be addressed that quickly, since the Prowriter is a pretty uncommon machine, but it's important to know that this is an issue. Or if you want to tinker with the protocol yourself, it might be a relatively simple fix; my guess is that the range for when to collect keys from the left and right side of the keyboard and consolidate them into a single stroke is just a little too low. If you want to experiment with changing timeout settings in the Stentura protocol, feel free to fork the code. Sorry again! Hopefully we'll fix this at some point. I tried the table with words but sometimes I received not those words which are in it. Thank you for bringing out such a wonderful software for everyone's use. You just have made my life a lot easier. Thanks you. Definitely going to check Zach's docs. Just started learning the other day. Does Dvorak really still jam things up? I did typed hello world with it. Really just wanted to mention that the video link is broken here. Does anyone know how to write Mom or Mother in Stenotype. We are celebrating our Mom's 90th birthday and she taught court reporting for many years using an old stenotype machine. We have Happy Birthday (HAP/PEU B*EURT/DAEU) but need Mom or Mother. Mother is PHOER. Best wishes to your mother!